Gorgeous, is it not?! Love the icy cold dungeon-feel of this one. Which is my own interpretation of this photo, as I'm sure it really wasn't. You know, year-round climate-control and all that. But I'd still rather believe it was all chilly and gloomy in there. I'm weird like that. Here's the mall's Current website. Does anyone know what the sign says at the very far end of this shot? I'm guessing its a store name, but I can't picture where this shot was taken in the mall. I'm guessing its the long corridor where sears and the food court is at one end and the Friendly's restaurant is at the other. In this shot, I think we are looking at the friendly's end as there is a stairway. The sears end of the mall didn't have a stairway, as far as I can remember? Isn't the Friendlys and Sears in the Court, not the Plaza? This looks like the stairwell right in front of Bloomingdales(????). Friendly's and Sears are in The Plaza. I would guess whan this picture was taken, Sears wasn't even part of the mall yet. In the latter years of this design, the space between floors had red and blue stripes painted on them. I have recently been scanning 2000 slides from my parents collection starting in the 60's and I have a few King of Prussia Mall pics from as far back as 1963. Back then everybody got dressed up to go shopping at a mall. I remember it was a completely open mall except for the upper end and the entrance my parents always used had a bunch of rocking horse and helecopter rides you got for a quarter. They were like mini amusement park rides. They started building more enclosed stores and converting some ot the existing ones in the 70's. I remember getting food at a place called the Purple Cow every time we went there. There were still open courtyard sections up till the mid 80's. The big construction at the end of the 80's finally closed it all up.. Wonderful memories. I'll have to post some pictures. 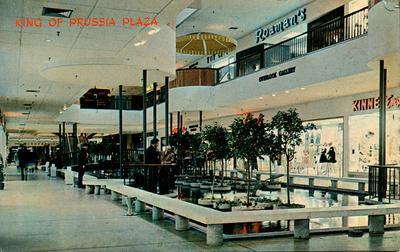 Both the Court and Sears did not arrive at King of Prussia until the mid 1980s. (I remember going into Babbergers when it first opened, looking out into the mall hallway and seeing all the empty store fronts) Where Penneys is now was a Gimbles (at least as far back as I can remember) and up by where Friendly's is, was John Wannamakers. It is definately that corridor, I think you are looking in the direction of where Friendly's is today. That was the only part of the mall that was two stories (again up until the mid 80s). The other department store in the Plaza was Korvettes. John Wanamakers was where Strawbridges is now. LOL, those fountains were loaded with coins. I remember going down the escalator to Kiddie City...that place was like a MECCA for me. It was overwhelming how many toys were there! Too bad that place went under. My educated guess is that the photo is taken standing in front of the entrance to JC Penney's looking away from the Wanamaker's end. The sign at the far end, on the larger image, could possibly say HANOVER, again by my guess, a now defunct shoe chain. I sort of recall the mall making a little "dog leg" at that point, and that store front was later occupied by another shoe store. There was (and still is) an open area just to the right of the store in question, with the old Gimbel's and later Penney's being across that open area. If we were looking toward the Friendly's/ Wanamaker's end, then one would see the spiral ramp, which doesn't seem to be present. I agree that at the time of this picture, probably early 1970s, Sears and the Food Court have yet to be built. the store at the ''far end'' of the pic should be John Wannamakers . the circular ramp dumped you right around it's downstairs entrance (if i remember, the upstairs entrance was right at the entrance to the circular ramp/escalator) . Did you ever post any of those early KOP Mall pictures? I would really be interested in seeing any from the early 60's to mid 80's. Great memories of the KofP mall. I love the photo. Does anybody have anymore photo's from the past of the mall?